Dimensions 0 by 6.50 by 9.45 in. Amazon.com description: Product Description: From 1970 a major project to uncover source material for students of contemporary British history and politics was undertaken at the British Library of Political and Economic Science. Fiananced by the Social Science Research Council, and under the direction of Dr Chris Cook, this project has attempted a massive and systematic operation to locate, and then to make readily available, those archives that provide the indispensable source material for the contemporary historian. This volume (together with the fourth volume in the series) presents the finding of this survey for the surviving political papers of every Member of Parliament and Government Minister between 1900 and 1951. Together, these two volumes, with over 3800 entries, will provide not only an invaluable guide for both the historian and political scientist but also a unique biographical work of reference. 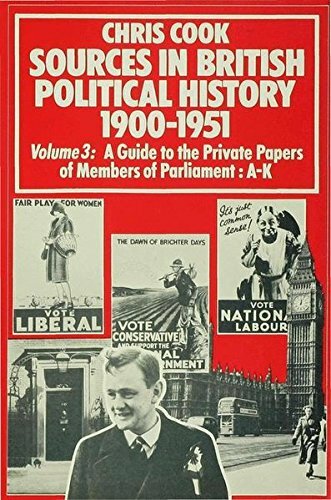 About: From 1970 a major project to uncover source material for students of contemporary British history and politics was undertaken at the British Library of Political and Economic Science.